There wasn't really a specific starting point. As a child and teenager I sort of did the odd painting but was told art was a hobby not an option. During my 30's I started making cards for Christmas and birthdays. After my 40th birthday I had one of those eureka moment when I realised I wished I had gone to art school. So I went to art school, part time as it was necessary to keep a proper job. Eventually I obtained a foundation qualification and went on to full time study. 14 years on art is my life. 2) What genre best describes the kind of art which you create and what drives you to make it? I use whatever genre works for me within my skill repertoire. At present digital imagery combined with embroidery seems to portray what I am trying to communicate. What drives me to make art is very much the core of how I am as a person. As a recovering alcoholic obsession and repetition are very strong aspects of my personality. It is 6 years since I stopped drinking and while I have learnt a lot about myself the undercurrents that fuelled my drinking now fuel my need to create. By studying Fine Art at B.A & recently M.A level I have been pushed right out of my comfort zone. As a person I have evolved along side my artwork. Looking back at the work I produced for my B.A at that time I seemed to focus on creating images that made me feel safe. Since then the use of colour and repetitious decoration have remained a consistent feature but I now use a greater range of media which enables me to be more expressive. In addition I can now see how in the past I and others have used the decorative as a facade to hide our real feelings and issues. Today my work expresses my pain and truth hidden behind that facade specifically relating to my addiction. So I have moved from producing something as a hobby to something which has enabled me to deal with real issues of my own and others. For me it is easier to express what I feel through art rather than through words. I have tried most of the mediums of creating art that appeal to me. When I was younger and fitter the idea of welding metal junk had some appeal and still does. There is an artist near my home who creates giant sized figures out of all manner of defunct metal items. The finished figures then corrode with the elements taking on evolving form. Generally though as my art evolves and new ideas emerge I apply new mediums that I feel help to express the subject I am communicating. My ideal solo show would incorporate the body of work I produced for 'Twelve Steps & Counting', which was the product of my Masters degree. I revisited Alcoholics Annonymous's 12 step programme of recovery, five years into my own sobriety to create art to express my response to this programme. The outcome was 12 individual mixed media paintings each one a response to it's partnered written step. The paintings and supporting narrative for each one was then catalogued and turned into a self published book. 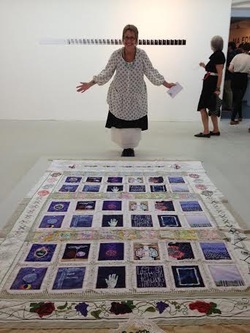 The final piece was a large textile which combined fabric prints of each painting woven into a patchwork with panels of embroidery, lace work and vintage bed sheets entwined. The aim of this was to pull all of the work together to express the overall experience which I was unable to do in words alone. What I most like about the art world is the permission it gives me as an artist to be free to communicate. My early life experience had been rather suffocating, with a heavy emphasis on a child being seen and not heard. My eyes were opened to this freedom by art and further advanced by art school. As a consequence I believe I have grabbed the opportunities art has given me to grow and enabled me to deal better with life's challenges. There are probably 2 artists who's work have been most influential. From the past Georgia O'Keeffee and from the present Chris Offili. Georgia O'Keeffee's work to me is beautiful, colourful and seductive. I also find Chris Ofili's work beautiful, colourful and inspirational. He has influenced some of my work particularly the 12 Steps. I find his work draws me in initially through its decorative nature then I discover much more as I explore the work. For example I found his 'The Upper Room' visually very powerful with an abundance of elaborate colour however once drawn in there is a far deeper message. The chapel like setting of the work greatly enhanced the overall effect resonant of the sacred and his inclusion of elephant dung in the juxtaposes this. 8) If you had to choose just one, what would be your favourite piece of art? Easy to answer this question too. I sold my first piece of work at a car boot sale. We were having a major declutter at home. The work in question was a pen & ink drawing of the Hindu god Lord Ganesh. It was the frame that I had expected to sell so it was a big surprise when someone wanted to buy the picture. I was quite chuffed! 10) What are you planning to exhibit at the New Artist Fair in September 2014? I am planning to exhibit an embroidered digital print on silk, it is framed and ready to go. In addition I am working on an embroidery that is all stitched in silk. This second piece is not ready and I am stitching at every available opportunity. As to any other work it depends on whether I get the embroidery finished, so wait and see.